If there’s one reason to pay attention to the Grammys — aside from getting yourself worked up over the fact that the worst song and/or album always seems to win its respective category — it’s Joy Villa’s sartorial decisions. The singer first made news back in 2017 with a “Make America Great Again” dress, one that was the source of many headlines in an industry where the mood is almost unanimously liberal. In 2018, she decided to wear a gown with an explicit pro-life message, according to Variety, again managing to throw a small cultural wrench into the proceedings. This year, however, she decided to go with something very timely: A dress in support of the president’s proposed border wall. The dress, which featured a brick pattern, was topped off with a “Make America Great Again” handbag. On the back, Villa was more explicit about her intentions, with “Build the Wall” written in red. She also wore a tiara of spikes and a shawl of barbed wire. All of that was a bit of an antidote to the big story of the Grammys, the surprise appearance of Michelle Obama. According to CNN, the former first lady appeared on stage with host Alicia Keys, Lady Gaga, Jennifer Lopez and Jada Pinkett-Smith. “From the Motown records I wore out on the South Side, to the ‘who run the world’ songs that fueled me through this last decade, music has always helped me tell my story. And I know that’s true for everybody here,” Obama told the audience. There seemed to be a lot more substance in Villa’s protest, and not just in terms of the dress itself. In an interview with The Hollywood Reporter, the singer defended the president’s proposed border wall. She also explained how she chooses her apparel. “I grew up in theater, so I’ve always used costume as a way to express myself,” she said. 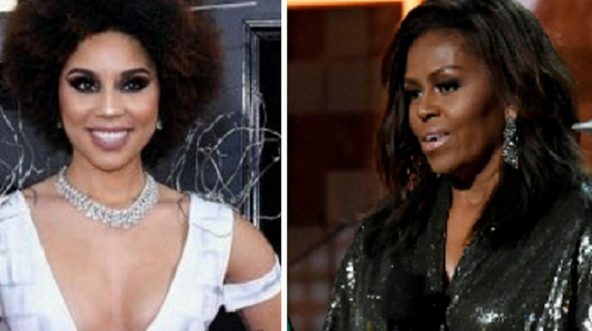 You’ll certainly remember Joy Villa’s dress, however. Liberals may hate her for it, but they can’t deny she’s got guts. And even if Villa didn’t know Michelle Obama was going to be at the ceremony, it turned out she had the perfect welcome ready.